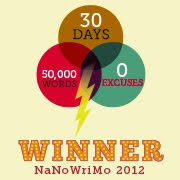 Today is the second day of NaNo and I'm pretty far behind. I've been in NYC since last Saturday, October 27. The day before 'Frankenstorm' Sandy devastated the East Coast. Yeppers, I leave the coast of South Carolina and travel TO a hurricane. Not my finest moment but who knew? We've been seriously sidetracked. Getting through the storm took all of my energy and concentration; there wasn't a lot of thought given to writing. Still, I managed to hack out roughly 700 words yesterday and another 700 today. Lame and slow but I'm way out of my regular writing routine *understatement* so I'm giving myself a break (sense a theme? I'm very forgiving). I'll try to get home tomorrow. LaGuardia is open now, so it's looking good. Hopefully I can write like the wind next week and catch up. I should be writing 1,673 words a day to reach the required 50,000 by the end of the week so I have a long road ahead of me. If you're doing NaNoWriMo, I wish you the best of luck. Let me know how you're doing. Hey Langley, I bet traffic was really light going into NYC when you did (most people would have been heading the other way indeed!)! :) Glad to hear you got thru it okay, tho. Will the storm make its way into the novel?